The college baseball season is winding down with the Division I World Series starting in June, and other divisions deep into their playoffs. On the road, there’s always fun bound to happen, but there’s one thing nobody looks forward to: The long bus ride. 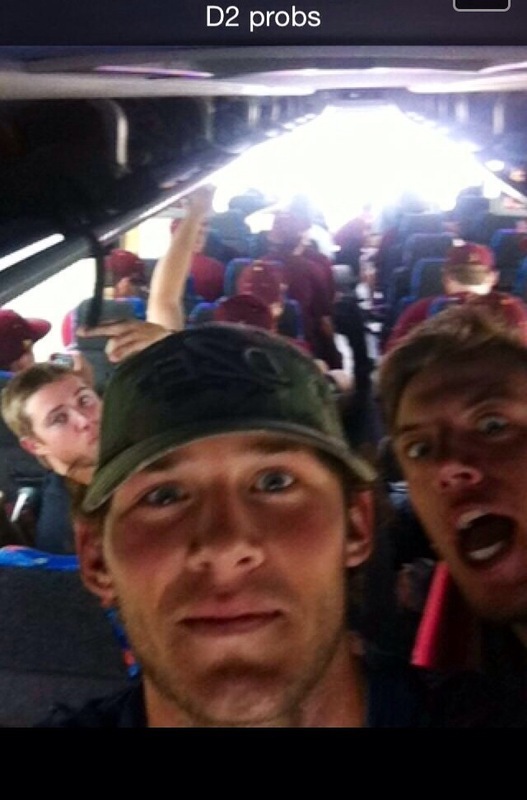 Many big Division I teams get to fly to road games or take nice buses, but as you can see in the picture above from my teammate Tyler Avera’s Snapchat, we’re not all as forturnate, hence the caption, “D2 probs.” The long bus rides are downright dreadful, but luckily there are ways to make them fun and productive. Good luck! We’re college kids, so there’s a good chance that you’re not getting that much sleep, so the first thing that you’re going to try to do on the bus is sleep. The key word there is try. To get comfortable on the bus is mashing your pillow the right way, finding the right spot on the window and putting your legs into a pretzel so you don’t go onto your neighbor’s side of the bus. There will always be that ridiculously tall person putting his legs on your aisle or sleeping on the ground, plus you’re most likely going to be sleeping with your mouth open or drooling. Again, good luck.